Today I'll be talking about the Influenster Go VoxBox. Influenster is a free program that puts out occasional "VoxBoxes". These are boxes full of complimentary products sent to you to review the items on your blog and/or social media accounts. To qualify for a VoxBox, you need a decent Influenster score and you must be in the demographics selected for that particular VoxBox. In order to raise your Influenster score, you must earn "Expert Badges" by taking surveys in various topics. So let's get to the box! The Go VoxBox is fitness/health themed. To be honest, I'm not quite sure how I qualified for this box since my Influenster "Expert Badges" are in topics like makeup, fashion, and pop culture. This bottle is perfect for shakes because of the little Jaxx shaped toy inside. When you shake the bottle, the little toy keeps everything mixed. The box came with 3 flavors of shakes, vanilla, fresh berries, and swiss chocolate. I'm afraid of powdery shakes because I feel that they will be gross and gritty but I'll try these out of curiousity. The package says that these will relieve foot, knee, and back pain. I don't suffer from any of those but I'll try them in some of my shoes to see if they'll help with comfort. These were very strange at first but ended up being delicious! This will be great for softening the heels of my foot during the summer months. This smells amazing and is super moisturizing! So that's it for the Influenster Go VoxBox. 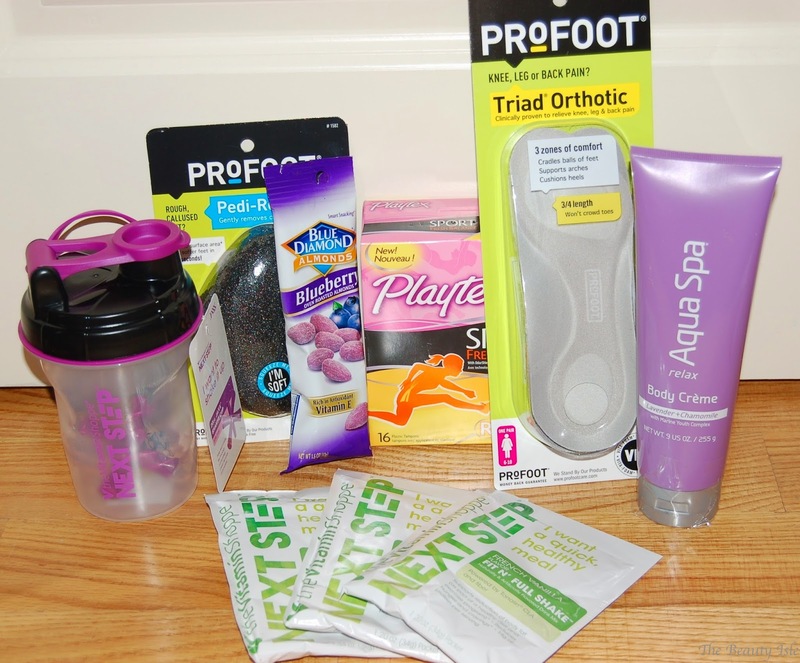 My favorite items were the pedicure rock and the body lotion (shocker, those are both beauty related items). If you'd like to join Influenster you must be invited so please let me know in the comments if you'd like an invite and I can send one over to you.